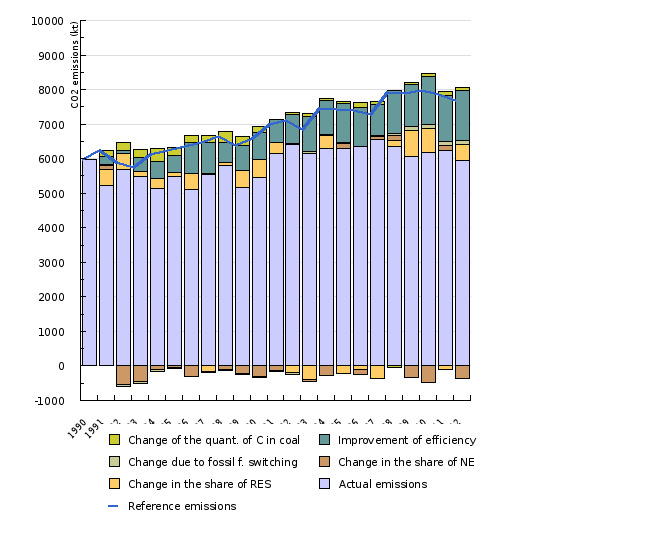 Even though electricity and heat production increased by 33 % in the 1990-2010 period, CO2, emissions increased “only” by 3 %, predominantly due to a greater efficiency of production. 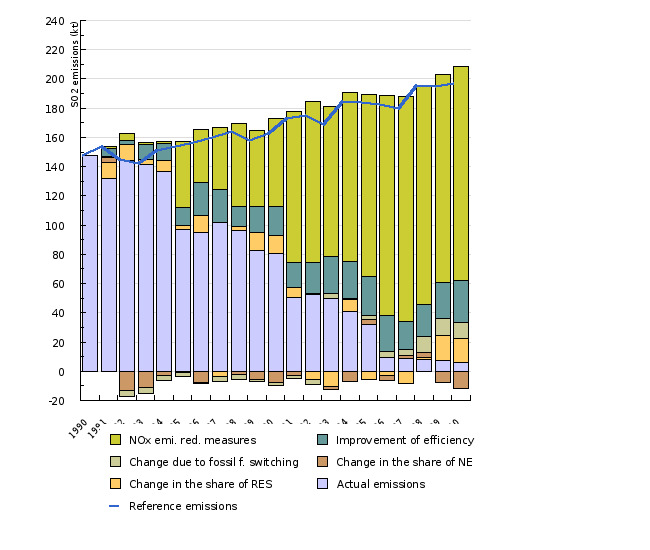 SO2 emissions reduced by 96 % due to the installation of desulphurisation devices and a greater production efficiency, and NOx emissions by 39 % due to the implementation of primary measures on installations used for the reduction of NOx emissions (installation or replacement of burners, etc. ), the improved methodology of calculating emissions and a greater production efficiency. This indicator analyses trends of past CO2, SO2 and NOx emissions from electricity and heat production from the viewpoint of implementing different measures and enables estimates to be made of the contribution of various measures aimed at reducing CO2, SO2 and NOx emissions. CO2 is the most important greenhouse gas that causes warmth to be trapped in the Earth’s atmosphere thus causing the surface temperature to increase. This will have numerous direct (more common and longer lasting heat waves) and indirect (greater frequency of extreme meteorological events, rise in sea level, etc.) effects on the ecosystem and the human population. A chemical reaction converts NOx into ground level ozone, while this gas, the same as SO2, contributes to the acidification of the atmosphere and emission of (secondary) dust particles. Statistical Office of the Republic of Slovenia, 2012; Slovenian Environment Agency, 2012; Jožef Stefan Institute, 2012. CO2 emissions: greenhouse gas emissions records, the Environmental Agency of the Republic of Slovenia, (see EN01). SO2 and NOx emissions: records of emissions of air pollutants, the Environmental Agency of the Republic of Slovenia, (see ENO9). Electricity and heat production: Energetska bilanca Republike Slovenije (Energy Balance of the Republic of Slovenia). - Electricity production by fuels (nuclear energy, fossil fuels, RES): 1990-1999 data provided by the Jožef Stefan Institute regarding electricity production in public thermal power plants and public combined heat and power plants (conversion of data from the Joint Annual Questionnaire). For the period following the year 2000, data as published on the website of the Statistical Office of the Republic of Slovenia on 6 October 2008 in the SI-STA online application were used. Electricity production of auto-producers has not been considered. - Heat production: 1990-1991 data provided by the Jožef Stefan Institute for heat production in transformations. Heat production of auto-producers was estimated as 10 % of total production. 1992-1999 data provided by the Jožef Stefan Institute for production of heat in public thermal power plants and combined heat and power plants, from the year 2000, data as provided by the Statistical Office of the Republic of Slovenia for the same items in energy balances. Fossil fuel consumption: 1990-2007 period, data provided by the Environmental Agency of the Republic of Slovenia, greenhouse gas emissions records (see EN01). Emission factors: 1990 data provided by the Environmental Agency of the Republic of Slovenia. - CO2 – greenhouse gas emissions records, (see EN01). - SO2 and NOx – calculating records of emissions for the year 1990. Data administrator: For GHG emissions records: the Environmental Agency of the Republic of Slovenia – Tajda Mekinda Majaron, for records of emissions of air pollutants: the Environmental Agency of the Republic of Slovenia – Bojan Rode and for energy balances: the Statistical Office of the Republic of Slovenia – Mojca Suvorov. Methodology and frequency of data collection for the indicator: Data are prepared on an annual basis. Energy balances for the previous year are available at the end of the current year and records on emissions for the previous year at the beginning of the next year. Reference emissions (Ref_emissions): These are calculated by assuming the situation had remained the same as in 1990 and that emissions increased at the same rate as electricity and heat production. Emissions reduction due to fossil fuel switching: The implied emission factor for all fuels was calculated on the basis of the emission factor for individual fuels (solid, liquid and gaseous) in 1990 and the share of individual fuels in total use in transformations in a specific year. Reduction due to abatement technologies: This reduction is assumed to be the residual difference. x CO2 emissions from electricity and heat production / fossil fuel input. The KAYA Identity is an accounting method enabling the impact of an individual factor to be estimated by addition and subtraction. It is important to be aware of the limitations of this method, as the estimated impacts of individual factors do not represent the exact impact of each factor due to being dependent on each other and the existence of interaction (different methods estimate the impact of individual measures differently). Despite its limitations, the method is useful as it provides indicative information about the importance (success) of different measures in explaining changes in CO2, SO2 and NOx emissions. Annual growth is occasionally shown in percentage points. The percentage point is a unit used in comparing different percentages. In percentage points, we are dealing with an absolute comparison calculated using the following formula: (nthis year) – (nlast year) = 16 % – 15 % = 1 pp (e.g. if there was a 15 % growth last year and a 16 % growth this year, then this year growth is 1 percentage point higher). The difference in growth can also be expressed by relative comparison using the following formula: [(nthis year / nlast year) * 100] – 100 = [(16 % / 15 %) * 100] – 100=6.7 %. In this case, growth is expressed as a percentage. Advantages and disadvantages of the indicator: The reliability of CO2 emissions estimates is very good, as internationally recognised methodology has been used (IPPC). Furthermore, national emission factors have been used for lignite and these depend on coal carbon content. Emission records are also subject to regular UNFCCC reviews. The reliability of SO2 and NOx emissions estimates is good, as data from records have been compared to data from emission measurements conducted at thermal power plants. In addition, internationally recognised methodology has been used (CORINAIR). As regards the manner of origin, SO2 emissions records have a higher reliability, as the quantity of emissions without flue gas treatment directly relates to the fuel’s sulphur content while NOx emissions depend on both the nitrogen amount in the fuel and the combustion process (combustion temperature, ratio between oxygen and fuel) which is specific for each boiler. As regards fossil fuel consumption, data from greenhouse gas emission records provided by the Environmental Agency of the Republic of Slovenia have been used in the calculations so as to enable the correct estimate of the changed carbon content in coal. This consumption is not completely consistent with data provided by the Statistical Office of the Republic of Slovenia, hence the differences in the production efficiency of electricity and heat. Reliability of the indicator (archival data): The indicator is reliable. - EEA, 2011. 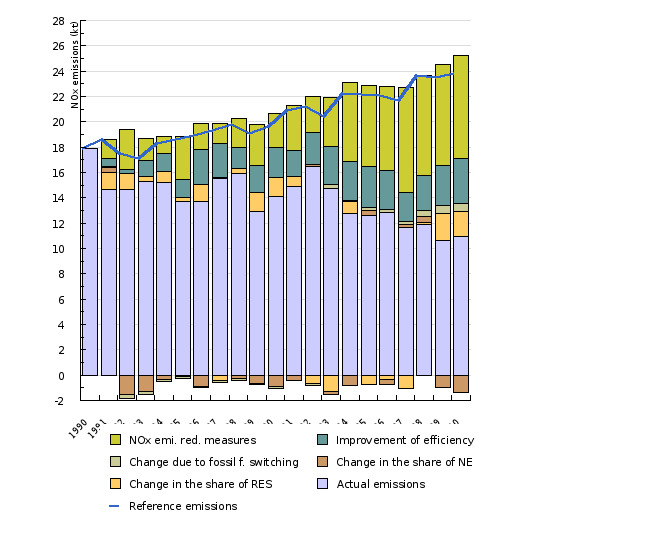 Emissions from public electricity and heat production - explanatory indicators (ENER 009) . - Ministry of the Environment and Spatial Planning, 2006. Operativni program zmanjševanja emisij toplogrednih plinov do leta 2012 (Operational Programme for Limiting Greenhouse Gas Emissions by 2012). - Ministry of the Environment and Spatial Planning, 2007. Operativni program doseganja nacionalnih zgornjih mej emisij onesnaževal zunanjega zraka /Revizija operativnega programa doseganja nacionalnih zgornjih mej emisij onesnaževal zunanjega zraka iz leta 2005/ (Operational Programme for Complying with National Emission Ceilings for Atmospheric Pollutants – Revision of Operational Programme for Complying with National Emission Ceilings for Atmospheric Pollutants from 2005/). - Šoštanj Thermal Power Plant, 2008. BilTEŠ 2007 - Poročilo o proizvodnji, vzdrževanju in ekoloških obremenitvah okolja TE Šoštanj v letu 2007 (Annual reports – Report on the Production, Maintenance and Environmental Strains for the Šoštanj Thermal Power Plant in 2007).